INTRODUCTION: A Revolutionary Day that parallels the end of the British Southern Campaign across Virginia. UNIVERSITY OF VIRGINIA, Charlottesville, Virginia: Founded by Thomas Jefferson in 1819. CHARLOTTESVILLE: Raided in June 1781 by Colonel Banastre Tarleton. MONTICELLO: Thomas Jefferson’s “little mountain” home. ASH LAWN-HIGHLAND: Home of President James Monroe. SCOTTSVILLE: Once a river port on the James River. POWHATAN: Once home to Revolutionary War General Charles Scott. RICHMOND: The capital of Virginia beginning in 1780. ST. PETER'S CHURCH: The first church of the First Lady. 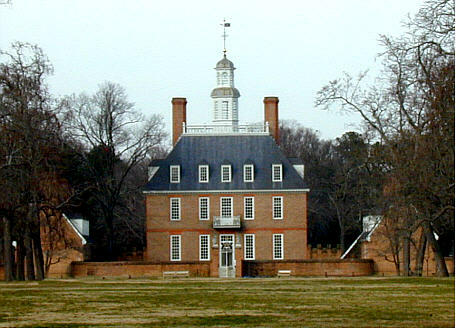 COLONIAL WILLIAMSBURG: The restored and reconstructed capital of Virginia from 1699 to 1780. YORKTOWN BATTLEFIELD: The last major battle of the Revolutionary War. Since February 2005, visits to this Web Page. Copyright © 2005 by Cyber Haus. All rights reserved.